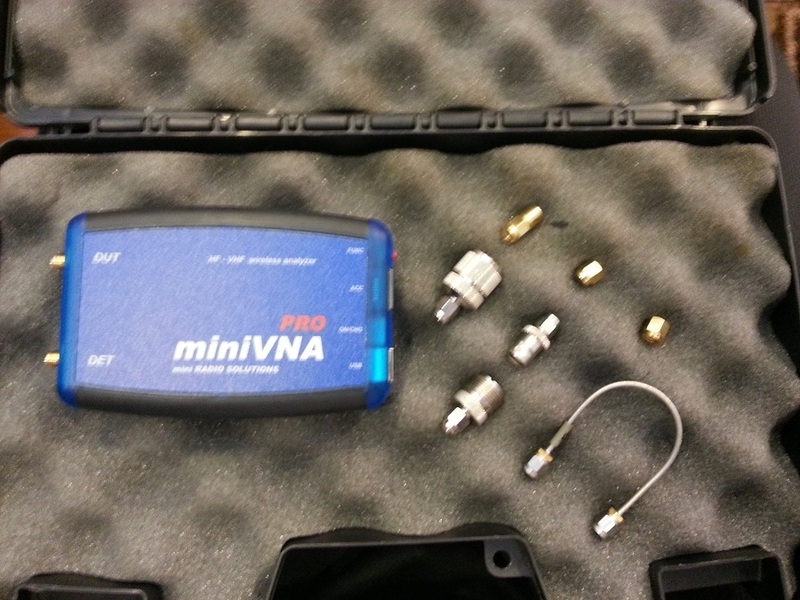 Introductory look into the MiniVNA PRO. As I get deeper and deeper into designing and building antennas, I figured I need something better than a SWR meter to make sure that my antennas are performing well. 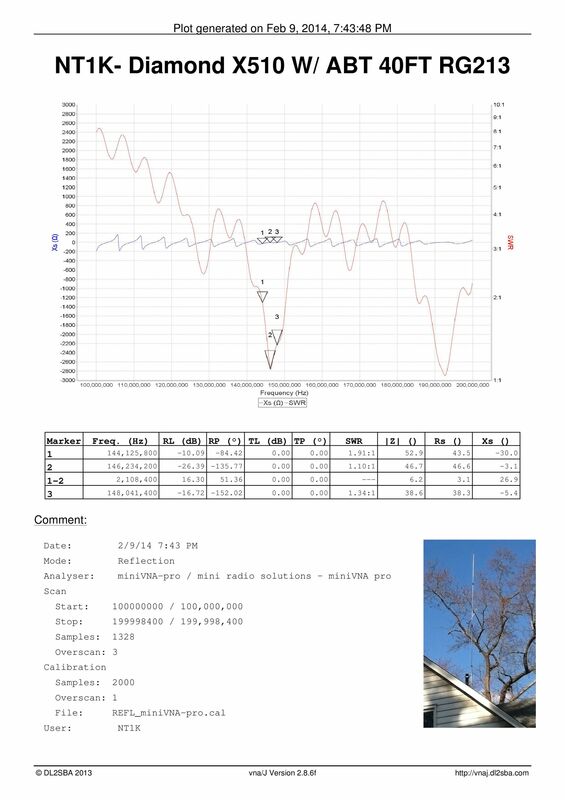 Since I am also publishing the antennas that I’ve designed and built here on this website, I would feel more comfortable knowing that it was done correctly. I needed some kind of antenna analyzer. There are so many choices out there today that I was not sure what to get. The most popular antenna analyzer for amateur radio use is the MFJ-259B. You’ll see it or a model similar in a lot of shacks around the world. I’ve used and enjoyed them but I felt that it was “Old School” considering technology has improved greatly. It was between the RigExpert AA-150 and the MiniVNA PRO. I purchased the MiniVNA as I felt it had more to offer. Being able to use Bluetooth to pair it up with an android device is what won me over. I found a used unit on QRZ for the price I was willing to pay. Wasn’t entirely sure about buying used test equipment but it ended up working out for me in the end. The reviews for the MiniVNA and the MiniVNA PRO were mixed. A lot of people had a hard time getting it to work with their computer and a lot of people commented about poor documentation and how it was not “User Friendly”. Some claim to receive DOA Units. When it comes to reviews from hams (or anyone really), I don’t take them all for face value because I’ve seen people who are so called “Computer experts” fail to perform the simplest tasks like installing a driver. Instead of fixing possible problems with their computer/equipment, it’s easier to blame someone or something else. You also have those who have egos that are so big that anything they touch is the best because they only buy the best. Then you have those who give honest reviews that detail how good or bad the product is. It’s hard to know who’s reviews should be trusted. Before the unit arrived at my house, I’ve read the 135 page manual about using the MiniVNA PRO and it’s software (vna/J ). I can see why people would think the manual is confusing. However I never used a VNA and I have no idea what any of the measurements mean other than SWR and impedance. I have a lot of learning to do so I can take full advantage of the VNA. Other reviews claim that the manual is NOT user (ham) friendly and geared toward experienced users but I feel that’s a challenge to learn more about the numbers I’ll be seeing. It will hopefully give me more insight into what’s happening with my antenna. I didn’t see much issue with the manual other than the order which topics were discussed. I’m lucky that the unit arrived right when I had some time to tear into it. Since it was used, I wanted to make sure it worked. It came with calibration slug/jumper cable and the seller even included a bluetooth module to hook up to almost any computer. Before even hooking it up to the computer, I went to FTDI’s website and made sure that I downloaded the latest drivers. Once installed onto my Windows 7 X64 OS, I hooked the VNA to the computer and the OS automatically recognized the VNA and assigned it a com port. So far so good! After downloading the latest vna/J (2.8.6f as of March 7th, 2015). I noticed it was a .jar file which tells me that it runs on the Java platform. Before running vna/J I made sure to update Java. Software started up with no issue and it was asking for a calibration file. First thing I did was go to the Analyzer menu > Setup. In the new window I highlighted the MiniVNA pro as well as the com port that is associated to the miniVNA. Once the proper unit/com port is selected, press the “Test” button. If successful, the status bar will turn green and “Update” button will come active. After pressing “Update” the screen will go away. You will still need to calibrate the unit. Calibrating the VNA is easy if you ask me. All you would have to do is go to the Calibration menu and choose “create”. A box will pop up and if you have the calibration kit (SMA connectors), hook the “open” connector to the DUT port and press test. Then hookup short and then the 50ohm load. Once the calibration is done, save it and then press the Update. You are now ready to use the VNA. 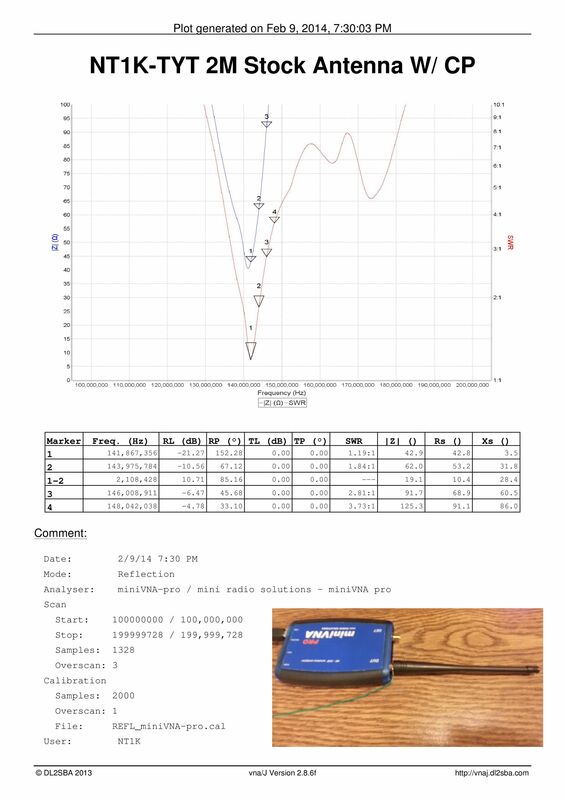 Whenever you load the vna/J software it will recall the last calibration file used. You can make different calibration files in case you’re adding adapters and cables you don’t want factored into the test. When you go into transmission mode, you will be asked to do a calibration using the jumper cable from DET to DUT. Similar to the reflection calibration. I’ve made a video showing the MiniVNA as well as installation and the first calibration. Since I’m hot to trot, I grabbed whatever was nearby and tested it. It happened to be my Butternut HF9V located in my backyard. It’s 100ft away from my house fed with LMR 400. There is currently 7 radials in the ground. 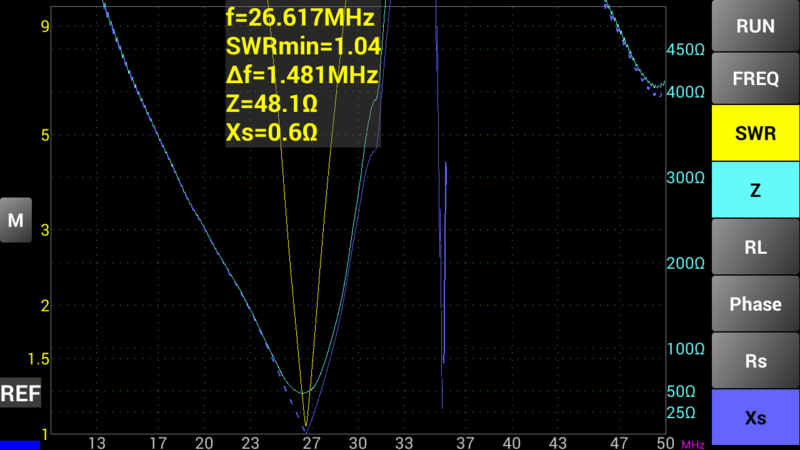 If the VNA is correct, I need to go out and re-tune my antenna. From this plot I can see 75M has very narrow bandwidth (as mentioned by Bencher) and I’m off on a bunch of other bands. Tried re-tuning the antenna outside but it was so cold I decided it can wait for another day. One of the main reason why I wanted this unit is because it’s truly wireless. There is an application for the Android that allows the miniVNA to be used with a smartphone or tablet. You could also use a laptop or desktop computer as long as it supports or could support bluetooth. I decided to try it wirelessly on a 10M dipole I had in my attic. If this is correct, then I need to shorten my antenna. It’s better than having too long instead of too short. The application “BlueVNA” was developed by Dan, Y03GGX. For a free program it’s really nice. I do have issues where the program force closes or stops working at random times on my Samsung Galaxy S3. It’s a minor annoyance but I can’t complain. reload the app and you’re back in business. 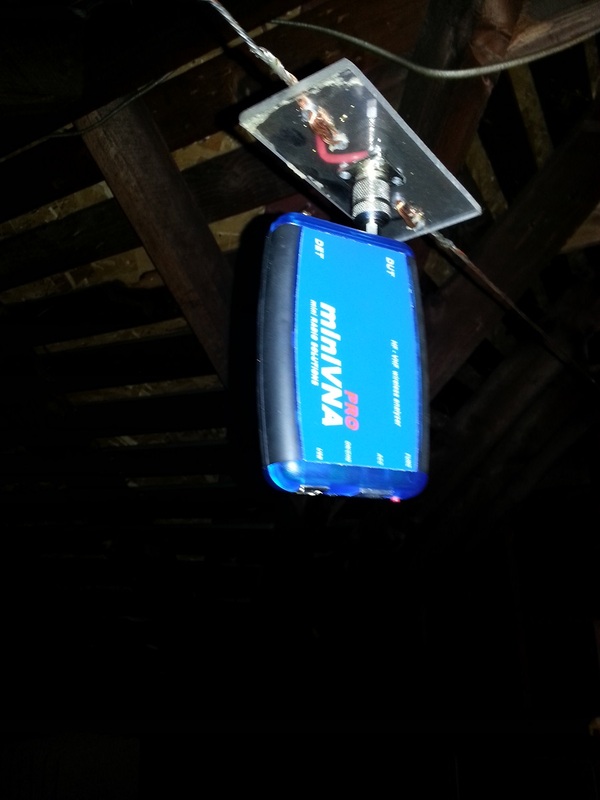 There is a claim that the miniVNA pro can transmit up to 100 meters which I would guess that would be under best conditions. Obstructions and quality of the other bluetooth module is a major factor. I’ve had it lose communications withing feet of the unit. I also tried it outside and worked well. I was able to see how the filter reacts through a range of frequencies. The Diamond X510 on my roof. Not bad, it was as expected. Rubber duck antenna that is on the TYT . I added a counterpoise to see what would happen as I feel that the chassis of the radio makes up the “other half” of the antenna. Very very weird results. After a few weeks of using the MiniVNA PRO, I’m quite impressed in what it can do for the small package it comes in. 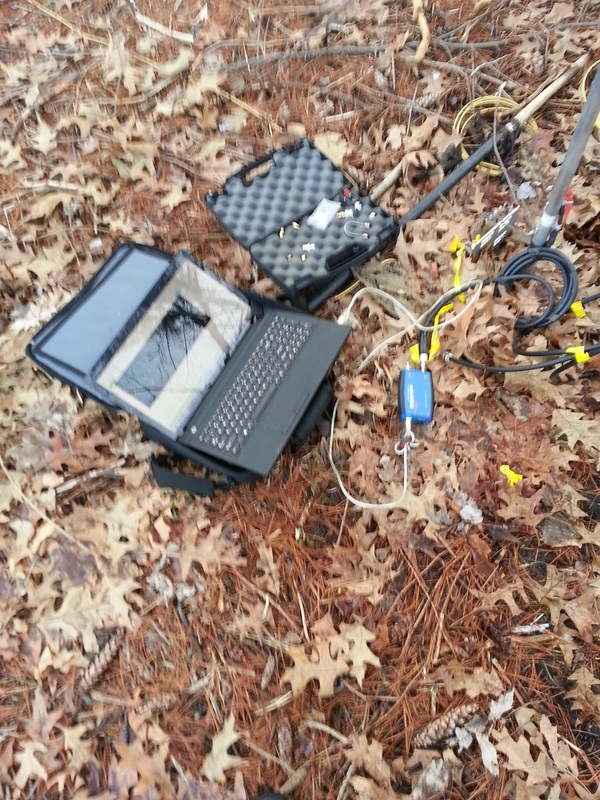 It was easy to setup (I think) and it was easy to use considering I never really used test equipment. Understanding what all the results mean is a different story but that means I have a lot more learning to do. I’ve tested basically everything I can hook it up to. If I were to get nit picky and they were going make a new version, I would ask for a metal enclosure, SMA connectors to be off the board and possibly an LCD screen with control buttons to make which would alllow to me to use the unit without the need for a computer or android device. 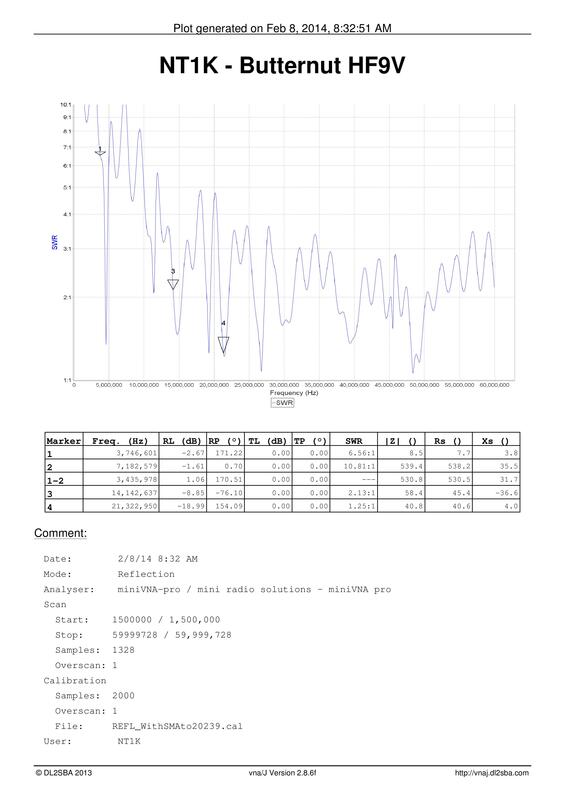 Author NT1KPosted on March 22, 2014 July 11, 2014 Categories AntennasTags Analyzer, Antenna, Measure, MiniVNA, MiniVNA PRO2 Comments on Introductory look into the MiniVNA PRO.